NEW YORK, July 19, 2018 /PRNewswire/ -- GSK Consumer Healthcare, one of the world's leading providers in specialist oral health, today announced a new five-year partnership with Smile Train, an international children's charity with a sustainable approach to a single, solvable problem: cleft lip and palate. Smile Train empowers local medical professionals, by providing training and education, to provide 100%-free cleft surgery and comprehensive cleft care to children all over the world. Every year, one in 700 children are born with a cleft lip or palate globally. Clefts are the leading birth defect in many developing countries, and it is estimated more than 200,000 children are born with a cleft every year. The announcement of this partnership comes at a pivotal moment for a baby girl in Chennai, India, Jaya*, who is the recipient of the first GSK-funded cleft surgery. Jaya was born in December 2017. Her mother, Sudha, was seven months pregnant when she was told by doctors at her local hospital that her child would be born with a cleft lip and cleft palate. Like many parents, Sudha and her husband Arun knew nothing about this condition. 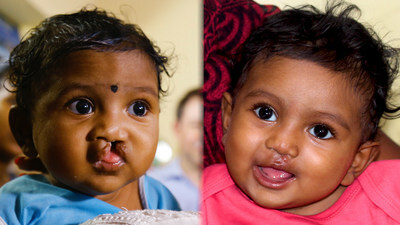 Jaya was born with a complete unilateral cleft lip and palate and Sudha struggled to feed her. Jaya was four months old when she underwent her first, successful cleft surgery performed by Smile Train's local partner, Dr. Jyotsna Murthy at Sri Ramachandra Hospital, in April 2018 and the transformation has been extraordinary. Today, Jaya is thriving. Jaya faces further surgery to fully correct her cleft palate. Her next surgery is scheduled for when she is nine months old. "With GSK Consumer Healthcare's heritage in specialist oral health, we know the importance of a healthy mouth. Our five-year global partnership with Smile Train will help provide thousands more surgeries for children with clefts and help increase medical training in local communities. I'm delighted that our partnership is already having an impact and we're inspired by the difference we've been able to make to Jaya and her family. However, this partnership will go far further than our financial support alone. "We're excited by the prospect of bringing together GSK's expertise and strength in oral health with Smile Train's knowledge and reputation in local communities to help increase awareness about cleft among both consumers and experts, and to provide vital support in oral health and hygiene for patients as part of the overall care pathway. "We'll also be encouraging our employees to give their time, skills, and donations to support Smile Train. Together both organisations are united in a shared vision and commitment to help transform more children's lives, one smile at a time." Children in developing countries with untreated clefts often live in isolation due to how they appear to others in the community. However, cleft lip and/or palate is much more than a cosmetic issue. Children with clefts often experience trouble eating, speaking and breathing correctly - which can be extremely detrimental to their overall health. "These are exciting times for Smile Train and we're delighted to welcome GSK on board as a major corporate supporter of our work. Smile Train's unique, sustainable model provides training and funding to empower local medical professionals to provide 100%-free cleft repair surgery and comprehensive cleft care at local medical facilities in the heart of their own communities. Our local medical partners are on the ground 365 days a year, continuously working to raise the level of care for all patients. "Cleft repair surgery is safe, and the results are immediate. Coupled with comprehensive cleft care services, like speech therapy and orthodontics, children who have access to this care then have the opportunity to go on to lead healthy lives. Combining the expertise of GSK and Smile Train will strengthen our model, allow us to tap into a new network of experts, raise much needed awareness for children with clefts, and ultimately help us ensure more children like baby Jaya receive life-transforming cleft treatment." Over the next five years, GSK and Smile Train will work toward the goal of ensuring children born with clefts can lead full and productive lives, achieving their own potential and contributing to their community. A recent independent studyquantifies the economic value of global cleft repair surgery, using patient data from Smile Train. For every $250 invested in a single cleft repair, as much as $42,000 is put back into the local economy as former cleft patients go on to contribute to economic productivity and lead full, productive lives in their communities. Our Consumer Healthcare business combines science and consumer insights to creative innovative everyday health care brands. We build world-class brands that consumers trust and experts recommend for oral health, pain relief, respiratory, skin health, nutrition and digestive health. We are experts in specialist oral health, combining our unique understanding of consumer needs with scientific innovation. With a broad range of science-based products, such as Sensodyne, parodontax and Polident, our goal is to make the world's mouths healthier. Smile Train empowers local medical professionals with training, funding, and resources to provide free cleft surgery and comprehensive cleft care to children globally. We advance a sustainable solution and scalable global health model for cleft treatment, drastically improving children's lives, including their ability to eat, breathe, speak, and ultimately thrive. We support research programs and awareness efforts, enabling the children we serve to reach their full potential.